Welcome Home! Amazing view lot location for this single level move-in ready Home! Highly desirable Mission Viejo neighborhood, and situated on a private corner lot. Cul de sac location with large open space green belt park. 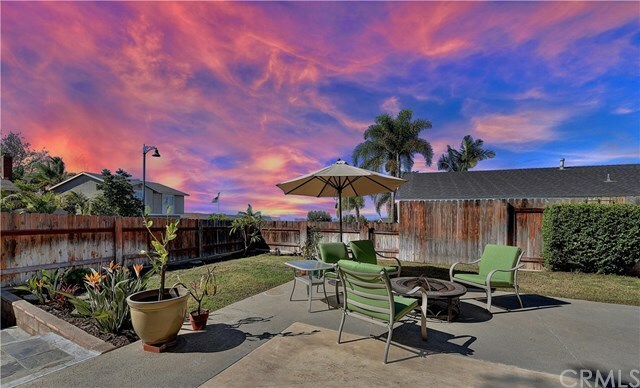 With stunning sunset and city lights views, this upgraded home features 3 bedrooms, and 2 baths. Spacious Family Room with cozy fireplace with brick surround, vaulted ceilings, crown molding. Upgraded kitchen with Granite Counters, Stainless Steel Appliances, opens to the Family Room, and slider door out to the spacious yard and amazing views. Spacious Secondary Bedrooms with ceiling fans, and large closet space. Beautiful Master Suite with walk-in closet, and amazing views. Interior Laundry Room with built-in Storage. Large Hallway Closet for additional storage. Wainscoting, Plush Carpeting, Upgraded Tile Flooring, Recessed Lighting, Brand New Paint, Upgraded Windows, Crown Molding, Upgraded Baseboards, and more. Stunning backyard with amazing City Lights Views. The sunsets will take your breath away. Perfect for entertaining with a covered patio area, several grass areas, and beautiful views throughout the whole yard. Walking distance to Colinas Park, Barcelona Park, and Oxford Preparatory Academy. No Mello Roos, Lake Mission Viejo Rights! This home is a must see!